You can now apply for BPS 2019. If you applied online last year (2018), we’ll have sent you an email explaining that you can find everything you need to apply for 2019 on GOV.UK. If you used a paper form to apply last year, we’ll send you a paper form for 2019. You should receive it by the end of March, if you don’t, let us know. But you don’t need to wait for it to arrive to start your application. Call us on 03000 200 301 and we can help you apply online. No matter how you apply, make sure you visit our BPS 2019 page on GOV.UK to read this year’s guidance. For 2019, we’ve published a land guidance page. This gives information for farmers and land managers about the land you use for rural payment schemes. For example, you’ll find the RLE1 form and guidance and land-use codes on this page. You can watch our YouTube videos which we hope will help you. We’re updating these for 2019 and they’ll be available soon. We’ll keep you updated with latest news and reminders, so make sure we have your most up to date email address and telephone number (mobile if you have one). Check and update them using the Rural Payments service. You can also follow us across our social media channels to get the latest updates. (and if you haven’t already – subscribe to this blog). Please ‘retweet’ and ‘like’ our posts – that way customers who do not follow us yet can see them. It may help your friends and family find out useful information before they submit their application. The deadline for applications is 15 May - make sure you do not leave it too late to submit your application. As long as you’ve submitted it by 15 May, you can make certain updates to your application, if you let us know, up until 31 May. 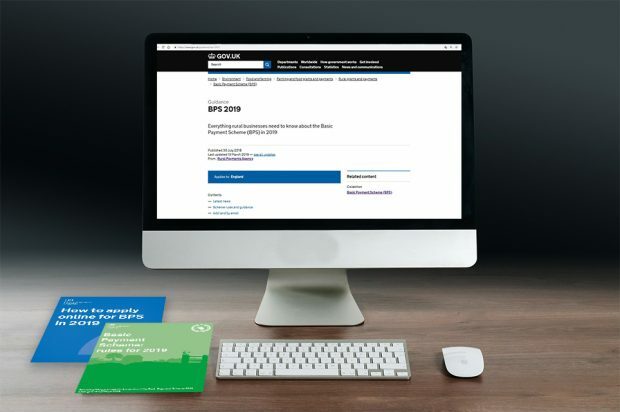 Search ‘BPS 2019’ on GOV.UK for everything you need to apply. To sign in to the Rural Payments Service go here: https://www.gov.uk/claim-rural-payments (You'll need your CRN and Password). Please let us know if there is anything else you need.